non-volatile residue (NVR) including: oxygen cleaning, aqueous cleaning and degreasing, ultrasonic cleaning, and emissions and pressure testing of clean valves. Built to accommodate small to large, heavy industrial-manufactured components, the MOMENTUM cleanroom facility meets industry standards for ISO 4 Class 10 (flowbench), ISO 5 Class 100, ISO 6 Class 1000 and your specifications. Typical parts include valves, piping, tubing, fittings and other various industrial equipment. MOMENTUM's analytical laboratory uses quantitative particulate verification for molecular non-volatile residue. 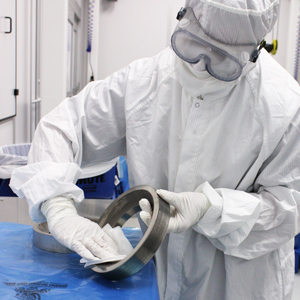 Samples are collected by flushing with an organic solvent and evaporating off the solvent, then measuring the contaminates on a semi-micro precision weighing scale. Receiving, surface preparation, testing, assembly, documentation, inspection and packaging are built into the total processing timeframe. In some cases, this could mean same day delivery—while in other cases, several days. In either situation, MOMENTUM Services will work with you to ensure your satisfaction. Our processes and procedures are designed with safety and environmental impact considerations. All cleaning agents are handled and disposed of within environmental guidelines. A complete set of Material Safety Data Sheets (MSDS) are kept current and on file. Contact one of our sales consultants today at 281.449.0294 to answer your questions or to provide a competitive quote for your next precision cleaning job. 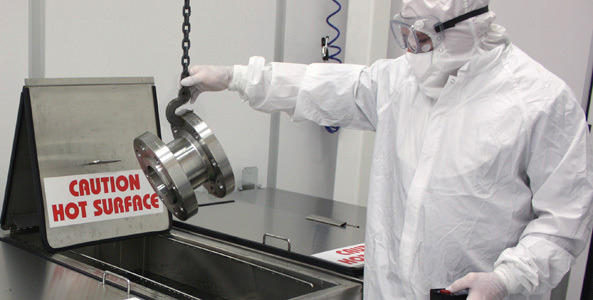 Industrial parts, medical devices, electronic components and much more are precision cleaned in our ISO 5 Class 100 cleanroom. Watch our video. See our facility.